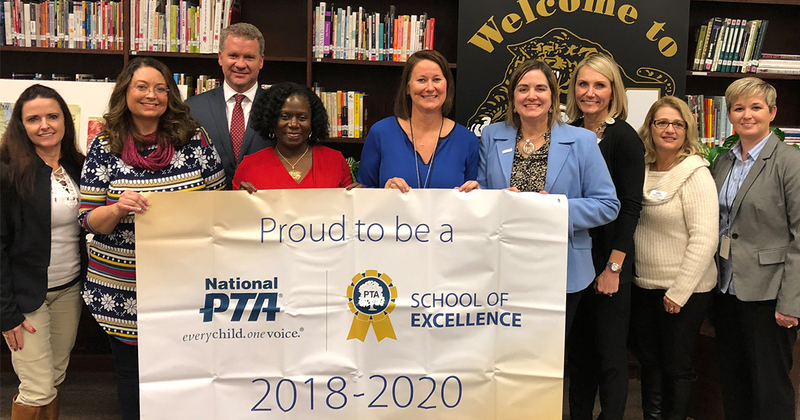 Mansfield High School was recently recognized as a 2018-20 National PTA School of Excellence. The award is given to parent-teacher associations (PTAs) that have demonstrated a strong dedication to family engagement to enrich the educational experience. PTAs that receive the recognition have made a year-long commitment in identifying and implementing an action plan for school improvement based on the national standards for family-school partnerships. Those standards include welcoming all families into the school community, communicating effectively, supporting student success, speaking up for every child, sharing power and collaborating with community. Mansfield High School also targeted the compassion efforts of its students, staff and parents as its goal to build a family-friendly environment. Through fundraisers, student community service projects and major pushes to support those who are battling cancer, that goal was achieved. The school celebrated its achievement on Dec. 6 with a ceremony and special proclamation presented by Texas PTA President Sheri Doss. A total of 279 PTAs across the country were awarded the National PTA School of Excellence this year. Last year, Cora Spencer Elementary School was named a National PTA School of Excellence. The distinction lasts for two years. View a complete list of winners here.